we finally dined at extra virgin last weekend and my only regret is that we didn’t experience it sooner! 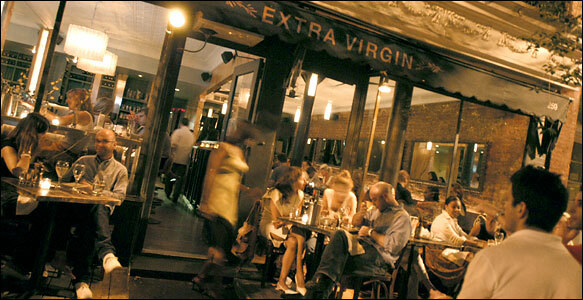 extra virgin is located in new york’s west village neighborhood and offers mediterranean food as well as varieties of extra virgin oils from around the world each night. extra virgin is primarily a “walk in” restaurant . . but not to worry . . . their bar is the perfect place to pass the time. this quaint little spot is fighting a hard battle for my full affection as the place i most want to dine and i must say they are doing a mighty fine job! be sure to treat yourself to extra virgin as soon as you can!